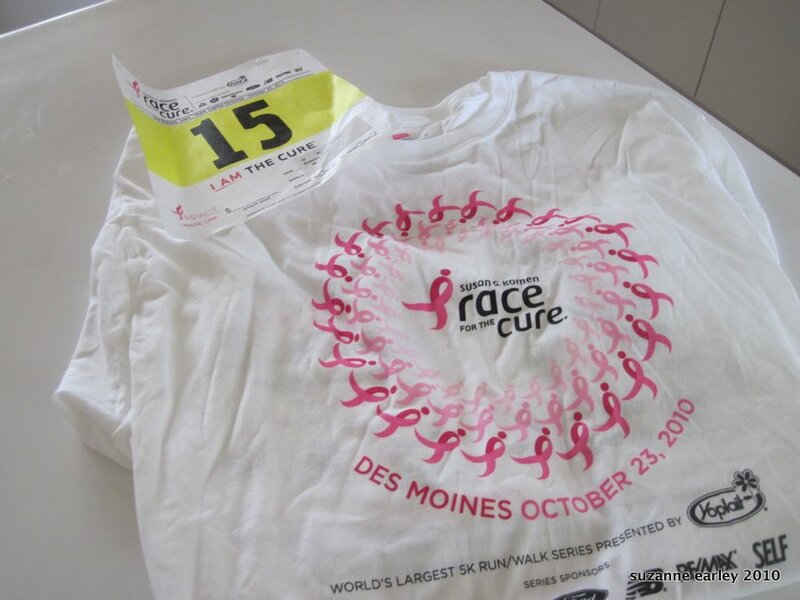 There are 12 days left until the Des Moines Race for the Cure. My so-called “training” got run off the rails by a number of things over the last 10 days, but I’m somewhat sort of back in action. Mostly, I’m freaked out by the fact that my race packet arrived the other day. They have 18,000+ runners signed up, and I ended up with number 15. I could have just as easily ended up as number 16,879, but I think it’s really kind cool to have gotten a number like 15. You’ll notice that when I do pin on my number, I have a spot to write in how much I raised. The goal I set was $500, but in my effort not to be obnoxious and pushy about asking for money, it seems that I made it sound like I didn’t really need anyone’s help at all. Well, that’s not how I meant it to come out. So I’m going to try again, because I do need your help, but more importantly, the cause needs your help. A portion of the money raised goes towards breast cancer research, the bulk is used for local education, screening and treatment support services. One of the reasons I ended up going quiet here on the blog was that my Grandma Humphrey passed away a little over a week ago. She was a breast cancer survivor, and I’ll be walking/running in her memory. I’m also doing this because I need to take better care of myself. I know that times are tough, or maybe you are already supporting a Race for the Cure participant, or you have allocated your charity dollars somewhere else this year, but if you can help me reach my goal, I’d really appreciate it. When you click on the “Make a Gift” link, you’ll be presented with a bunch of radio buttons with “suggested” donations, the lowest being $25 — you can always type in your own amount, even as little as $5. And even if you can’t donate, please be thinking of me and my effort to convince my body that walking/running 5K is a good idea. I’m so sorry to hear about your grandma. You’ve sure been in my thoughts these past few days. I hope you know that you are dearly cared for. I’m quite proud of you for taking charge of your health and for participating in the race for a cure. I lost both parents to cancer, as did Scott. I wish I was there to cheer you on! I’ll be cheering you from California!